Setting up a wireless home network has gotten easier, but it is crucial that you secure the system to prevent unauthorized use. If you're not comfortable doing so, feel free to call us. Most installations will not require more than an hour of our time. 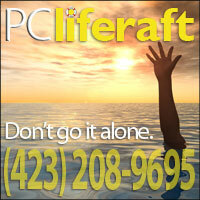 Call us at 423-208-9695 or e-mail to support@pcliferaft.com. If you should be routed to voice mail, be assured that we will be alerted within a few minutes to your call.